Costa, T. & Soares-Gomes, A. Relative growth of the fiddler crab Uca rapax (Smith) (Crustacea: Decapoda: Ocypodidae) in a tropical lagoon (Itaipu), Southeast Brazil. Pan-American Journal of Aquatic Sciences, 3(2): 94-100. Download PDF file (506 Kb). Abdallah, V. D., Azevedo, R. K. & Luque, J. L. Notes on the morphology of two species of Gussevia Kohn & Paperna (Monogenea: Dactylogyridae) parasitic on Astronotus ocellatus (Agassiz) (Perciformes: Cichlidae) from Brazil. Pan-American Journal of Aquatic Sciences, 3(2): 101-104. Download PDF file (262 Kb). Vitule, J. R. S., Umbria, S. C. & Aranha, J. M. R. Record of native amphibian predation by the alien African catfish in the Brazilian Atlantic Rain Forest. Pan-American Journal of Aquatic Sciences, 3(2): 105-107. Download PDF file (78 Kb). Ambrozevicius, A. P. & Abessa, D. M. S. Acute toxicity of waters from the urban drainage channels of Santos (S�o Paulo, Brazil). Pan-American Journal of Aquatic Sciences, 3(2): 108-115. Download PDF file (227 Kb). Kassuga, A. D., Silva-Ferreira, T. C. G., Ostrovski, M. C. & Costa, T. M. M. Population structure of Munida microphthalma Leach (Crustacea: Decapoda: Galatheidae) from the north coast of Rio de Janeiro State, Brazil. Pan-American Journal of Aquatic Sciences, 3(2): 116-121. Download PDF file (94 Kb). Nilin, J., Castro C. B., Pimentel, M. F., Franklin Jr, W., Matos, R. F. G. & Costa-Lotufo, L. V. Evaluation of the viability of a microscale method for the short-term chronic toxicity test using Lytechinus variegatus embryos. Pan-American Journal of Aquatic Sciences, 3(2): 122-129. Download PDF file (159 Kb). Farro, A. P. C., Rollo Jr., M. M., Silva Jr., J. M. & Marino, C. L. A simple protocol for a low invasive DNA accessing in Stenella longirostris (Cetacea: Delphinidae). Pan-American Journal of Aquatic Sciences, 3(2): 130-134. Download PDF file (2,000 Kb). Silva, F. L., Ruiz, S. S., Bochini, G. L. & Moreira, D. C. Functional feeding habits of Chironomidae larvae (Insecta, Diptera) in a lotic system from Midwestern region of S�o Paulo State, Brazil. Pan-American Journal of Aquatic Sciences, 3(2): 135-141. Download PDF file (126 Kb). Vidal, L. & Kruk, C. Cylindrospermopsis raciborskii (Cyanobacteria) extends its distribution to Latitude 34�53�S: taxonomical and ecological features in Uruguayan eutrophic lakes. Pan-American Journal of Aquatic Sciences, 3(2): 142-151. Download PDF file (320 Kb). Oda, F. H., Oda, T. M. & Felismino, M. F. Original scientific photographs. 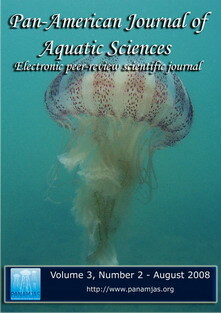 Pan-American Journal of Aquatic Sciences, 3(2): I. Download PDF file (79 Kb). Montenegro, J. & Acosta, A. HaviStat� v 1.0 - Aplicaci�n para evaluar uso y preferencia de h�bitat. Pan-American Journal of Aquatic Sciences, 3(2): II-VI. Download PDF file (454 Kb).